Goddess Durga is the Goddess of power. She is a form of Goddess Shakti, the female cosmic energy. Goddess Durga is worshipped in Her nine forms and hence is termed as Nav-Durga. The nine forms of Goddess Durga are revealed in Devi Mahatyam Devi Kavacham by Lord Brahma Himself. 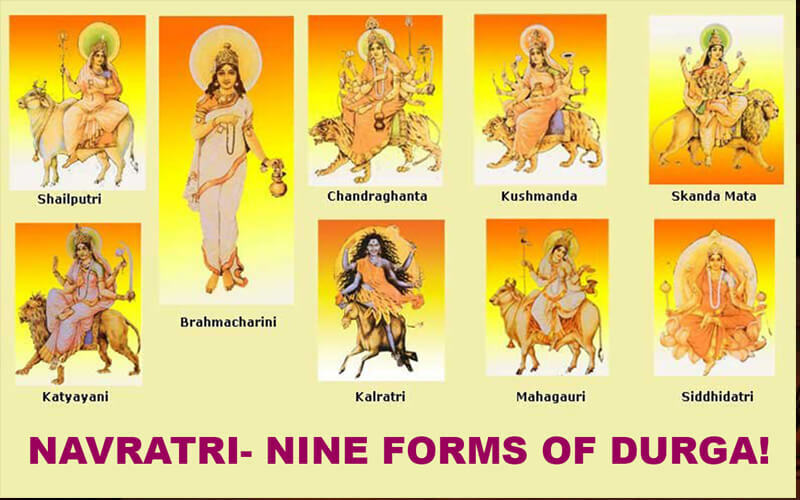 The nine manifestation of Goddess Durga are Goddess Shailputri, Brahmacharini, Chandraghanta, Kushmanda, Skanda Mata, Katyayani, Kalratri, Maha Gauri and Siddhidatri. As stated in ancient Vedic texts these nine forms of Maa Durga are worshipped during Navratri meaning the nine divine nights. Goddess Shailputri: Maa Shailputri is considered to be the first manifestation of Goddess Durga. Shailputri is worshipped as the daughter of the mountain Himalaya. Goddess Brahmacharini: Maa Brahmacharini is the second form of Maa Durga. Maa Brahmacharini is one who practices penance. Legend goes that Naradaji predicted that Maa Brahmacharini would marry Lord Shiva but She would have to perform penance to attain him. Goddess Chandraghanta: Maa Chandraghanta is the third form of Maa Durga worshipped on the third day of Navratri. Maa Chandraghanta adorns a crescent moon on Her head. She is the destroyer of sins, distresses, physical sufferings, mental tribulations and ghostly hurdles of the devotees. Goddess Kushmanda: Maa Kushmanda is the fourth manifestation of Goddess Durga. She is worshipped on the fourth day of the Navratri. Maa Kushmanda is also named as ‘Adi Shakti’, She is the one who created the universe. Goddess Skanda Mata: Goddess Skanda Mata is four-armed and rides on a lion. Skanda Mata is the fifth manifestation of Goddess Durga and is worshipped on the fifth day of the Navratri. Kartikeya is also called Skanda and thus Skanda Mata means mother of Skanda or Kartikeya. Goddess Katyayani: Maa Katyayani is worshipped as the sixth manifestation of Goddess Durga on the sixth day of Navratri. Maa Katyayani is the daughter of sage Kaatyaayana who performed penance of Goddess Durga and asked Her to be born as Her daughter. Goddess Kalratri: Goddess Kalratri is the cruel and violent side of Goddess Durga. Maa Kalaratri is worshipped on seventh day of Navratri. Goddess Kalratri is the destroyer of darkness and ignorance. Goddess Siddhidatri: Goddess Siddhidatri is the provider of knowledge; She is worshipped on the ninth day of Navratri. Legend goes that Lord Shiva got all the ‘Siddhis’ by worshipping Maha Shakti. Goddess Siddhidatri is the one who fulfills of wishes of devotees. ← Why do Gods have animals as Vehicles?